Despite their financial straits, the Leylands have immaculate fashion sense, manners, and a newly-discovered opportunity: their crotchety relative, Sir Basil, dislikes his current heirs, who never made it into the highest circles of society. If Lydia can maneuver things just right–making Bayard and herself society sensations–there is a chance the old man will change his will and make her brother’s fortune. Of course, Lydia’s machinations earn her the enmity of her cousin, Mr. Pentony, who schemes to destroy the Leylands’ prospects. Meanwhile, the Leylands’ prospects rise. Lydia sets her cap at two promising targets: a wealthy older fop and an awkward young man who is tied to his mother’s apron-strings. The only problem is that the latter, more appealing query, is planning to marry Lydia’s cousin, who has fallen desperately in love with Bayard. The latter liaison can only lead to disgrace. Equally disastrous is the way Grandma Leyland is losing money at cards in an attempt to bolster the family’s waning resources. Somehow, Lydia must match up the right couples, save her brother from a fatal error that will turn Sir Basil against them, fend off Mr. Pentony, and find herself wealthy, titled husband. Always on the sidelines, Northover is amused, impressed, and concerned by Lydia’s impetuous behavior and meddling. At the same time, he is reconsidering his conviction that he is “not a marrying man.” Bit by bit, he steps forward to help her–gestures that are inevitably misunderstood by Lydia, who assumes the Viscount wants to give her a slip on the shoulder rather than a proposal of marriage. Lydia, on the other hand, is a strong heroine. A go-getter with an agenda, she has no concerns about using her strengths–her beauty and her intellect–to get what she thinks she wants. Unlike many Regency heroines, Lydia is not plagued by self-doubt. Indeed, her greatest flaw is her inability to recognize another schemer when she meets him. Generally good hearted, she cannot fathom the duplicity of a foe like Mr. Pentony. On the downside, it bothers me that the American family spent several years holed up on a Louisiana plantation. They complain about the dullness of being trapped there–due to financial problems–with only dull servants for company. Considering the plantation setting and the era, Darcy’s dodge of slavery and negative depiction of the Leylands’ “servants” turned me off. Fortunately, the topic only came up briefly. Although I disliked Clare Darcy’s Cecily, Lydia amused and entertained me. 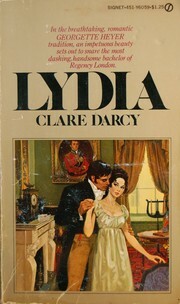 This book convinced me that Darcy’s “Heroine” series deserves to be reviewed on this site. Though slightly weaker than the similarly conceived The Best Laid Plans, Lydia proved to be an entertaining, fast read, in spite of its 253 pages.